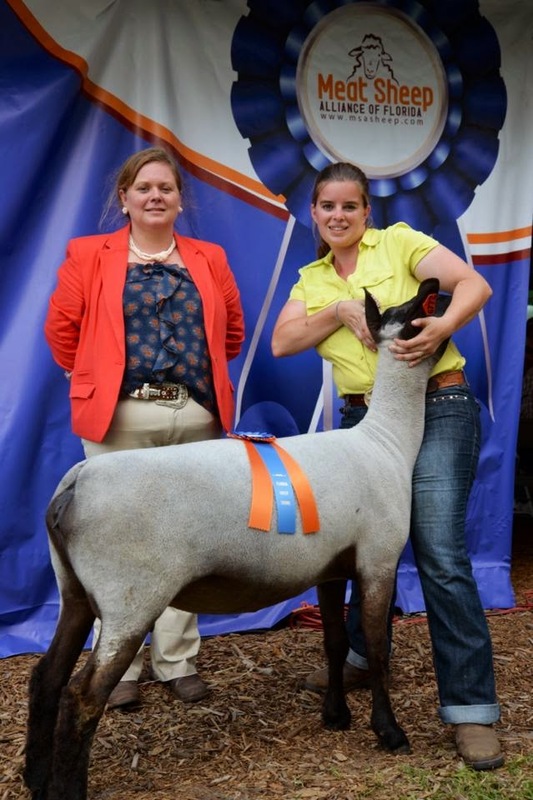 I was honored after the first of the year to judge the Meat Sheep Alliance of Florida's final show. Not only did it give me a chance to do one of my favorite things(judging) it also allowed me and the boys to take a road trip and send some much needed time with my big sister and her family. I was even more honored and thankful for all the kind words and Facebook messages I received after the show. I was able to interact with a great group of kids and parents! This was the first time I had taken the boys on a road trip by myself. But they did awesome for 99% of the trip! This was how they rode most of the time. One napping, while the other entertained his self with games, books, DVDs, music and toys! We were able to stop for lunch at my favorite BBQ place in all the world! If you have never tried Purvis BBQ in Louisville, GA you need to make a special trip to this small town. I promise you won't regret it! Even Wyatt gave it 2 thumbs up! This unfortunately is the driveway to where I grew up. Behind that fallen down tree and up the lane sits the house my Granddaddy built in the early 80's. This is where I developed a love for agriculture, learned how to halter break a calf, learned the books of the Bible (which I still can't remember 1/2 the time), spent hours riding my horse, and listened to my Granddaddy tell stories while watching the Braves game. I wish now that I had paid more attention to my Granny's cooking and sewing that is lost behind this overgrowth. That I had listened when she tried to share Jesus with me, that I had appreciated what was at the end of this driveway just a little more. This overgrowth made me realize the importance roles others played in my life. So instead of just driving right through my small hometown...I stopped and chatted with my Ag teacher for a minute and was lucky to get to see another family friend as well (I just wished I'd gotten to see his wife & girls too). The boys and I also made a stop at ABAC. It was this place that introduced me to the Farmer. It was here that I learned the importance of speaking out for agriculture. It was ABAC that taught me no matter how entrenched you think your community is in agriculture there are still those folks who only know food comes from the grocery store. ABAC is also where I learned to put my thoughts on paper and advocate...long before anyone thought they had too. If you pick up a copy of Pegasus (ABAC's literary publication) from the 2002-2003 school year you will find a copy of my award winning essay "5 Legged Calf Found Eating Mutant Green Corn." It was a non fiction piece discussing GMO's and the public's perception. After visiting with Rachel (Farmer's Baby sister) for a few we headed South to see this girl play in the powder puff football game at her high school. Living 7+ hours apart we don't get to experience many of the "regular" parts of life with my sister and her family. So it was a treat to just enjoy each other's company. Wyatt's highlight of trips to Florida always include hanging out with his "super cool" big cousins and playing video games (that he has no clue how to play). We were able to enjoy a local festival while we were in town as well. It's neat to see how different towns celebrate their past, present and future. Wyatt even coaxed Paige into riding the train around the mall with him. Which honestly made his day! Of course we have to have a few pictures of all the kids together. It's funny there is the same age difference in Paige & Farm Boy as there is between Scotty & myself. I wish I could find a picture of Scotty & I when I was 19. I'm sure he was loving time with his favorite aunt! We did some sister pictures too. I love spending time with my big sister and just talking. We don't get to do it nearly enough. I also just realized that apparently there are no pictures of my brother-in-law from our trip. He did a good job of hiding from the camera I see. No worries Scott we love you! I mean really you have been part of my family for 20+ years now (over 1/2 my life you know!). After a tearful goodbye the boys and I headed home but not before a pitstop at Amelia Island. The kids had a great time playing in the sand. Farm Boy loves the ocean no matter the time of year and even though the water was cool he dove right in. We have decided if he ever leaves the farm, you will find him at the beach. Farm Boy #2 (he's no longer a baby :( )on the other hand preferred sitting on a towel munching on sea shells & sand. A boy has got to eat you know! We had a great time and a wonderful trip. Can't wait until we get to visit with our family again!